[:en]In Australian Aboriginal cultural and spiritual belief, there was a time when sacred totemic and ancestral spirits formed the land and all of creation. This time is sometimes referred to as the Dreaming but this word is not a clear translation, there are many different names for this time in Aboriginal languages eg. Alcheringa, Tjukurpa, Ngurampaa…. and over 200 more. The Dreaming establishes the structures of society, rules for social behaviour, and the ceremonies performed to ensure continuity of life and land. The Dreaming governs the laws of community, cultural lore and how people are required to behave in their communities. The condition that is The Dreaming is met when people live according to law, and live the lore: perpetuating initiations and Dreaming transmissions or lineages, singing the songs, dancing the dances, telling the stories, painting the songlines and Dreamings. They believe that every person essentially exists eternally in the Dreaming. This eternal part existed before the life of the individual begins, and continues to exist when the life of the individual ends. Both before and after life, it is believed that this spirit-child exists in the Dreaming and is only initiated into life by being born through a mother. The spirit of the child is culturally understood to enter the developing fetus during the fifth month of pregnancy. When the mother felt the child move in the womb for the first time, it was thought that this was the work of the spirit of the land in which the mother then stood. 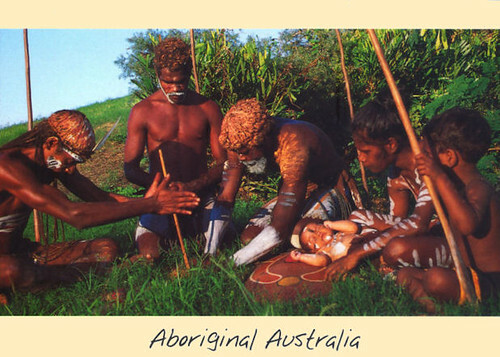 Upon birth, the child is considered to be a special custodian of that part of his country and is taught the stories and songlines of that place (1). In my mother’s time birthing was carried in one’s own country with all the rituals and traditions such as squatting over a prepared hole in the ground covered with soft grass and leaves as well as soft red sand (3). The female midwives such as my grandmothers and other designated women attended to give physical and emotional support such as holding and massage, and this lessened the discomfort of labour. More particularly it removed fear, and fear is responsible for so many prolonged and complicated labours. Birthing in our traditional society was always “Women Business” (3). In some parts of Australia during the 19th century Aboriginal midwives were the only people with expertise to act as midwife for both Black and White women. Dame Mary Gilmore in her memories describes her early years in rural New South Wales. She acknowledged that the only women with any expertise in managing child- birth in the white frontier communities of those times were Aboriginal women. She goes so far to say that Aboriginal women had far more experience than the white doctors, when they were available (3). 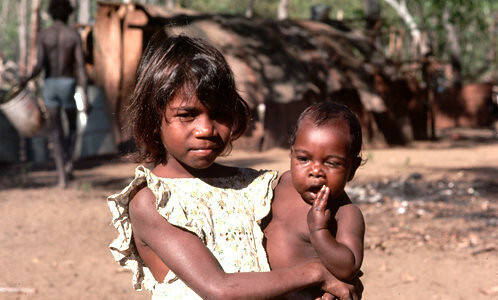 There is anecdotal evidence that before the European invasion and particularly before the dispersal that preceded the incarceration of the first people in missions and Government settlements, pregnant Aboriginal women suffered few medical complaints during pregnancy (3). The former might be delivered in the local hospital, but they may be segregated to an iron shed at the back. Those in remote communities and on cattle stations might choose to be delivered in the bush which was an attempt to keep away from the authorities, so that the baby would not be seized and removed to a mission settlement. Such a strategy destroyed the traditional rituals that surrounded childbirth (3). 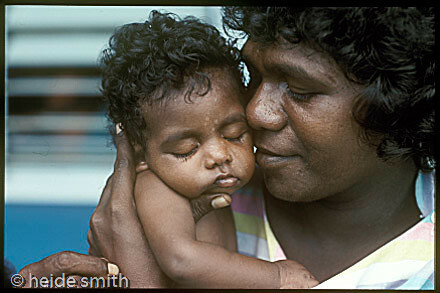 Some 30 – 40 years ago it was decided that maternal and neonatal mortality could be reduced by compulsory evacuation of Aboriginal women in late pregnancy to regional hospitals for delivery. All across the North from the Kimberleys, Arnhem Land, Cape York and the Centre of Australia, have had to birth in large regional hospitals (3). I believe this represents two sides of the coin. On the one hand life saving medical interventions are put within reach. On the other hand, women not only had more delayed labour, but required greater intervention. We have known for some time that extreme anxiety felt by women in labour or even before confinement can lead to prolonged labour (3). I am suggesting that dislocation of identity is one of the reasons why young Aboriginals began to drink alcohol excessively, leading to a breakdown of taboos and early pregnancy. Among my Walmadjari people these sexual liaisons may be “wrong- side” and this can create further social disruption. Add to this an increasing prevalence of smoking which will further the risk of foetal asphyxia (3). These effects may lead to premature labour, low birth weight and increased perinatal mortality, as well as foetal alcohol syndrome leading to brain damage and poor intellectual development. I argue that evacuation of an Aboriginal woman to a city hospitals for delivery has produced not only social disruption in her family and community but also had the effect of prolonging her labour because of the fear engendered through removal to a foreign environment. What could be a normal delivery at home is turned into an abnormal one with increasing rates of intervention. These issues have long been recognised in Canada. Inuit’s not born on their land are not seen as belonging. *Those Aboriginal women at low risk of complications of labour be allowed to choose confinement in or near their own country and facilities such as provision of midwives are made available for this to happen; as is the practice among the Nunavit in Northern Canada. *That Aboriginal babies born to mothers evacuated from their country for delivery should have the name of that country entered on their birth certificates. Klänningar_balklänningar online,balklänning,bröllopsklänning,billiga balklänningar[:pt]In Australian Aboriginal cultural and spiritual belief, there was a time when sacred totemic and ancestral spirits formed the land and all of creation. This time is sometimes referred to as the Dreaming but this word is not a clear translation, there are many different names for this time in Aboriginal languages eg. Alcheringa, Tjukurpa, Ngurampaa…. and over 200 more. Na cultura e nas crenças espirituais do Aborígenes, houve uma época que os sagrados espíritos totêmicos e ancestrais formaram a terra e toda a criação. Esse acontecimento é por vezes referido como o Sonho, mas esta palavra não é uma tradução clara, há muitos nomes diferentes na linguagem Aborígene, como: Alcheringa, Tjukurpa, Ngurampaa …. e mais de 200 outras. O Tempo do Sonho estabelece as estruturas da sociedade, regras de comportamento social, e as cerimônias realizadas para garantir a continuidade da vida e da terra. O Tempo do Sonho rege as leis da comunidade, conhecimento cultural e como as pessoas são obrigadas a se comportar em suas comunidades. A condição que é Tempo do Sonho é cumprida quando as pessoas vivem de acordo com a lei, e vivem o conhecimento: perpetuando iniciações e transmissão do Tempo do Sonho, cantando as músicas, dançando as danças, contando as histórias, pintando as canções e sonhos. Eles acreditam que cada pessoa essencialmente existe eternamente no Tempo do Sonho. Esta parte eterna existia antes da vida do indivíduo iniciar e continua a existir quando a vida chega ao fim. Antes e depois da vida, acredita-se que este espírito-filho existe no Tempo do Sonho e só é iniciado na vida quando nasce através de uma mãe. Acredita-se que o espírito da criança entra no feto em desenvolvimento durante o quinto mês de gravidez, quando a mãe sente a criança mover no ventre pela primeira vez. Após o nascimento, a criança é considerada como um guardião especial de parte de seu país (da sua tribo ou região) e é ensinada as histórias e versos de canções daquele lugar (1). No momento do nascimento, ou pouco antes do nascimento, a criança recebe totens. Um totem liga a pessoa diretamente com o tempo de criação e o mundo espiritual ( O tempo dos Sonhos) , e com todos os seres vivos. Totens definem relações das pessoas entre si e lhes dá seus direitos e papéis específicos dentro do grupo (2). Encontrei um texto muito interessante de uma mulher que nasceu entre os aborígenes e que mais tarde tornou-se parteira, explorando como era a cultura de parto dos aborigenes e como está agora. “No tempo da minha mãe o parto era realizado com todos os rituais e tradições como ficar de cócoras sobre um buraco preparado no chão coberto de grama macia e folhas, bem como areia vermelha suave (3). As parteiras mulheres, como a minha avó e outras mulheres designadas, compareciam para dar apoio físico e emocional, tais como suporte e massagem, e este diminuia o desconforto durante o trabalho de parto. Mais particularmente, ele removia o medo, que é responsável por muitos trabalhos de parto prolongados e complicados. Parto em nossa sociedade tradicional sempre foi ‘Coisa de Mulher’ (3). Em algumas partes da Austrália durante o século 19, parteiras indígenas eram as únicas pessoas com experiência para atuar como parteira, tanto para mulheres negras como para brancas. Dame Mary Gilmore em suas memórias descreve seus primeiros anos na zona rural de New South Wales. Ela reconheceu que as únicas mulheres com qualquer experiência em gestação e nascimento naqueles tempos eram mulheres aborígenes. Ela vai mais longe e diz que as mulheres aborígines tinham muito mais experiência do que os médicos brancos (3). Aqueles que viviam em comunidades remotas e nas estações de gado escolhiam ir para o mato, como uma tentativa de manter-se longe das autoridades e hospitais, para que o bebê não fosse apreendido e removido pela missão. Tal estratégia destruiu os rituais tradicionais de nascimento (3). Alguns 30-40 anos atrás, foi decidido que a mortalidade materna e neonatal poderia ser reduzida por evacuação obrigatória de mulheres aborígenes no final da gravidez para os hospitais regionais para o nascimento (3). Isso representa dois lados da moeda. Pela a vida por um lado, salvando as intervenções médicas que são colocados ao nosso alcance. Por outro lado, as mulheres não só tinham o trabalho de parto mais demorado, mas requeriam mais intervenções. Nós já sabemos que a ansiedade extrema pode levar a trabalho de parto prolongado (3). Estou sugerindo que essa falta de identidade é uma das razões pelas quais aborígenes jovens começaram a beber álcool em excesso, levando a uma quebra de tabus e gravidez precoce. Entre as pessoas da minha tribo essas relações sexuais pode ser “do lado errado” e isto pode criar novas perturbações sociais. Adicionando a isso um aumento da prevalência do hábito de fumar que aumenta o risco de asfixia fetal (3). Esses efeitos podem levar ao parto prematuro, baixo peso ao nascer e aumento da mortalidade perinatal, bem como a síndrome do alcoolismo fetal levando a danos cerebrais e desenvolvimento intelectual pobres. * As mulheres aborígenes com baixo risco de complicações no parto serem permitidas escolher dar à luz em ou perto de seu próprio país, com disponibilização de parteiras para que isso aconteça, como é a prática entre os Nunavit no norte do Canadá. * Que os bebês nascidos de mães aborígenes retiradas de seu país para o parto devem ter o nome de seu país em suas certidões de nascimento. 1- Bates, Daisy. Aboriginal Perth and Bibbulmun biographies and legends, Hesperion Press.1996. 2- Queensland Studies Authority . Birth ceremonies, totems and rites in Aboriginal society. 2008. Loved the information and views here.